What does it take to get nominated for a regional TV news Emmy? Just go out to your local soccer patch with a wheelbarrow full of watermelons and record yourself gleefully smashing them under falling goalposts. 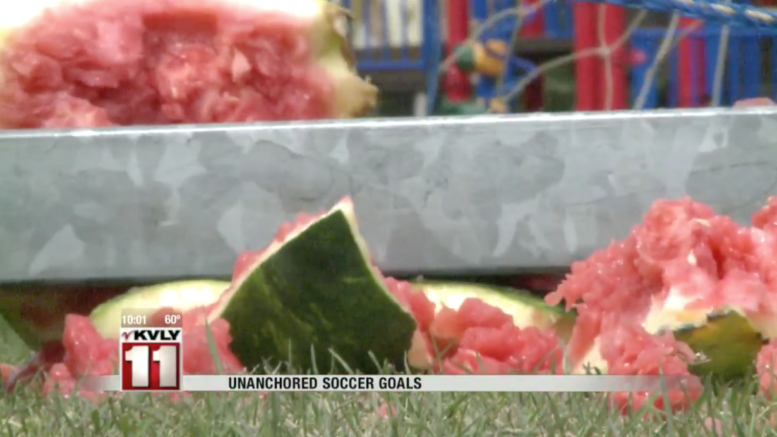 That’s exactly what Bradford Arick, a reporter for Fargo’s KVLY-TV, did for a story on what could happen if your child was crushed by an “unanchored” soccer goal. Thirty-nine people have been killed this way since 1979. By comparison, 40 to 50 people die from lightning strikes each year. Arick’s report, which is nominated in the “Investigative Report” category of the 2016 Upper Midwest Emmys, is typical of TV news: Find some statistics and “localize” them, in order to stir up fear and Facebook likes. Arick is the same reporter who brought you the story describing refugees as disease vectors waiting to infect you and your kids with tuberculosis. Fearmongering has been a hallmark of KVLY, thanks to Arick, General Manager Jim Wareham and News Director Ike Walker. In their world, it’s better to misinform and frighten folks, as long as higher ratings result.